Following their promotion to the top tier of the Sheffield County Senior League at the end of last season, Denaby United are now playing their homes games at Balby Carr Community College / Sport Centre. This is due to Step-7-esque regulations regarding facilities, which required more than was available at their previous Old Road home in Conisbrough, where the club had been playing since reforming in 2011. Of interest to groundhopping types who like a programme, the club is also issuing a matchday magazine for its home games this season – and very well produced it is too. The set-up at Balby Carr is quite an impressive one, with several games going on tonight on a variety of pitches. Over the hedge in the adjoining field were kids and womens games, while there is also an enclosed smaller artificial pitch which for some reason has a sign saying ‘Old Trafford’ on the outside of it. Passing a gaggle of disappointed Japanese tourists with Zlatan written on their backs, Denaby set up to play against local rivals Houghton Main, mainstays of the County Senior League in recent years and always relied on to give their opponents a good game. As the 5-4 scoreline suggests, there was not much between the two teams tonight. Main seemed to win more of the aerial and physical midfield battles, though ultimately it was a couple of defensive errors in the second half which put them beyond United’s reach. Though the homesters rallied towards the end, and were given fresh energy and added vim and vigour following some substitutions, Houghton Main were able to hold out for a slender victory. Some encouraging signs though for United as they attempt to climb the table – especially a fine direct free-kick scored by Martin Lawton (pic below), and the ubiquitous class of veteran centre-forward Steve Ellor – someone who played for the original club in 2002 and is still one of the best finishers in local football. 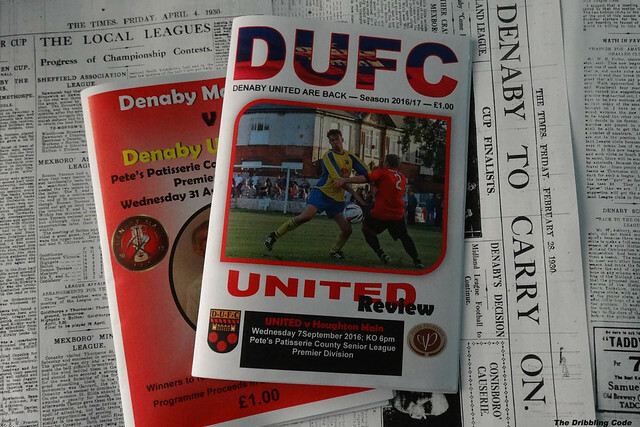 This entry was posted in A-Z by club (home team), Denaby United, Uncategorized. Bookmark the permalink.